Hello! My name is Marianne Henio and I live in the West Midlands in the UK. I am a knitwear designer, pattern creator and publisher, and ‘Henio’ is my brand. The name ‘Henio’ came from my Polish father’s entry into the UK after WWII when he put his nick name ‘henio’ (short for Henryk in Polish) on his papers. This was to become the family name. We are unique 😉 After my mother, I am the only Henio…apart from all the Henryk’s in Poland, of course! My passion for knitting came about from a very early age, being taught by my Grandmother to hand knit. This love has never left me. Very early on I found that I could create a design without a pattern – ‘knit-as-you-go-along’ I call it. I have moved on from then and now use dedicated software to pattern design, although occasionally I will knit as I go along for fun. 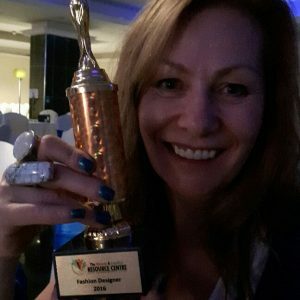 In the 1980s I left my career path in the Police Force to become a mother. During my pregancy I knitted a lot of baby socks. One day I was walking past a local yarn shop when this contraption just jumped out infront of me!! It was something I had never seen before – a knitting machine. I visualised myself knitting the most up to date and trendy baby outfits at a very fast rate of knots (or indeed knits! ), and so I had to have the thing! That was my first Brother punchcard knitting machine. After my son was born I moved on from creating enormous amounts of baby knits to the advanced stages of adulthood knits. My confidence grew on the machine and I began to produce some reasonable garments. My family knew exactly what they were getting for Christmas and birthdays! Mainly ‘Pringle-like’ sweaters. However, I got orders too 🙂 Realising that there was potential here to earn some cash I swiftly moved into the Party Plan business. I bought a rail, designed and knitted about 20 garments, created colour cards (yarn kindly donated from that yarn shop which started all this! ), and then pestered friends relentlessly to hold designer bespoke knitwear parties. As you may be beginning to realise by now, this wasn’t the usual ‘girl goes to college to study fashion design’ route. However, after a year of party plan I found myself the proud owner of a retail outlet and some loyal customers. I rushed into business as a naive, but highly enthusiastic, 22 year old. I had also become a single mother by this time. I had two mortgages – home and shop, plenty of ideas, but not many years experience in the business world, and very much on my own (apart from my Mum and son). After a few years and a massive amount of struggle, and to cut a long story a bit shorter, I went to University. I converted my shop into a house and moved in along with my young son, and went on to gain my BA (Hons) Degree and then my Masters. A lot happened in between, by the way! 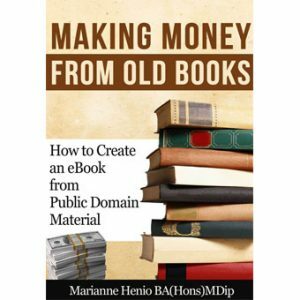 I had learned the art of self publishing and published my first book, ‘Making Money from Old Books‘. This was followed by ‘Images of Women in Art‘ and ‘How to Build a Website from Scratch‘. The growth of Amazon had paved the way for budding writers (me included) to move away from chasing the big publishing houses to being able to self publish their own work. And online possibilities were growing. Throughout the years I had also continued to knit, both hand and machine. (My son was one of those ‘unfortunates’ who wore ‘Mum’s knitted creations’ to school and stood out from all the other regimented school uniform wearers on the playground.) I was beginning to realise that the patterns available for the machine knitter were still very much stuck in the 1980’s, design-wise. There really wasn’t an aweful lot available. Of course, the machine knitting market had cooled down by this time compared to its explosion in the ’80s. Design just hadn’t moved on with the times. It was at this point that I saw an opportunity of combining my passion of knitting and my ability to design and pattern write with my new skills in self publishing. My mission was (and still is) to design modern, up to date designs for machine and hand knitters. Often I like to combine the two crafts. There was already a lot going on in the hand knitting world so I knew there was a market. I had a passion to help bring knitting as a trendy craft into the 21st century. And so the company Henio Creative Ltd was born. I designed my first hand and machine knitting ‘Collections‘. 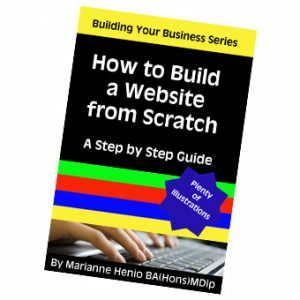 I had built my website (hence the book). I just needed an audience to see if my designs/patterns were going to hack it. I was not a huge company with a bottomless advertising pit, or pot. It was just me. I immediately saw social media as my obvious route into getting my designs and patterns seen by knitters. I joined various groups and began to enjoy participating with like-minded and talented knitters. Then I was invited to join a Facebook knitting group by a member who had come across my designs (thankyou Cristina). That was where the journey really took off. In 2016, among other designers, I was asked to create some designs for the catwalk show at the ‘All Womens Achievers Awards Ceremony‘ in Birmingham. 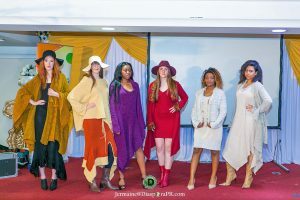 I took 8 knitwear designs along with me and my models, and came home with the Fashion Designer’s Award! As a contributor to the Machine Knitting Monthly print magazine, I happily wrote monthly articles for 18 months which culminated in two more books 🙂 ‘Love Your Body: What to Wear for your Body Shape‘ and ‘The Zodiac and the Meaning of Colour‘. Added to this book list I wrote ‘Knitting for Therapy‘, and I sincerely believe that knitting is one of the best therapies on the market! Having had the honour of being a guest speaker at both the AGM of the Guild of Machine Knitters, as well the Nottingham Machine Knitting Annual Exhibition, I have been able to share my vision with numerous passionate knitters from all walks of life. I have learned so much about this industry over the last few years that I could write another book! (Oh no! Here comes another!) It’s been a real roller coaster ride, and continues with the ups and downs. 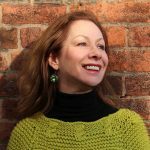 My continued mission is to provide the knitting world with modern, professional, and up to date knitting patterns – both for hand and machine knitters. Independent designers and pattern writers are struggling in a marketplace where so many free patterns are being offered. I truly appreciate the support I get from my fellow knitters, followers and customers. Thanks to Yeoman Yarns, I now get to sell some of their beautiful yarns here from my ecommerce store too. I am also privileged to be able to offer a beginners entry machine from SilverReed, the LK150 mid-gauge machine, from the machines section of my store. I love the idea that I can offer more hand knitters the opportunity to explore the possibilies of machine knitting. Recently I have also started to offer some extra products that I feel are useful to the knitter. I have called these ‘Knitting Aids‘ and I hope to introduce more of these delightfully interesing and irresistible gadgets as time goes on. As I continue to design, write and publish my knitting patterns, and offer the best knitting products that I can source, I am always at the ready to answer any queries that you may have about my work. Please feel free to use the Contact Us form or email me at marianne@henio.co.uk. I am also available on social media on Facebook for hand knitters, Facebook for machine knitters, Ravelry, Pinterest, Instagram and Twitter. Please join me there. So there you have it. My story about Henio.